Over the past twenty years, we have used our hands and wisdom to create our own influence in the world. Lo Yi Stone, the legend of never fading. 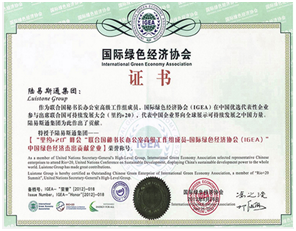 Rio +20 summit, the United Nations Secretary General's office of the senior working group member of the International Green Economic Association (IGEA), China's outstanding contribution to the green economy enterprise] honorary title. Luistone, through the urban ecosystem, low carbon industry and recycling economy, investment and financing and international investment to achieve China's eco city construction. Luistone is committed to the expansion of eco city construction and promotion, widely participate in Chinese city construction, urban renewal in many city, land use, multi financing, ecological landscape construction and ecological construction has accumulated a wealth of practical experience. Successful operation in China for more than ten years, won a number of high-profile cases and industry honors.